As Enola searches for the missing Lady Blanchefleur del Campo, she discovers that her brother Sherlock is just as diligently searching for Enola herself?and this time he really needs to catch her! He is in possession of a most peculiar package, a message from their long-lost mother that only Enola can decipher. Sherlock, along with their brother Mycroft, must follow Enola into the reeking tunnels of London?s dark underbelly as they solve a triple mystery: What has happened to their mother? And to Lady Blanchefleur? And what does either have to do with Mycroft, who holds Enola?s future in his everso- proper hands? No one, not even Sherlock, is left unchanged or unsurprised in this brilliant conclusion to the Enola Holmes mystery series. Nancy Springer has published forty novels for adults, young adults and children. In a career beginning shortly after she graduated from Gettysburg College in 1970, Springer wrote for ten years in the imaginary realms of mythological fantasy, then ventured on contemporary fantasy, magical realism, and women's fiction before turning her attention to children's literature. Her novels and stories for middle-grade and young adults range from contemporary realism, mystery/crime, and fantasy to her critically acclaimed novels based on the Arthurian mythos, I AM MORDRED: A TALE OF CAMELOT and I AM MORGAN LE FAY. 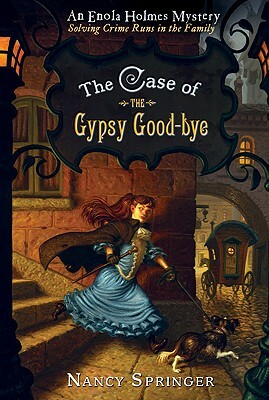 Springer's children's books have won her two Edgar Allan Poe awards, a Carolyn W. Field award, various Children's Choice honors and numerous ALA Best Book listings. Her most recent series include the Tales of Rowan Hood, featuring Robin Hood s daughter, and the Enola Holmes mysteries, starring the much younger sister of Sherlock Holmes. Ms. Springer lives in East Berlin, Pennsylvania."